For this year’s Christmas presents I continued the theme of my Postcards project. I wanted to give everyone something screen-printed, and joyfully marked with the snail-mail ink stamps. I also wanted to work with fun, low-key online interaction. 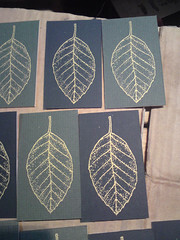 I screen-printed a 2 colour drawing of a treehouse onto envelopes, and a gold-on-green card leaf to go in the envelope. Each leaf has a unique adjective on the back, as the end part of a web address. 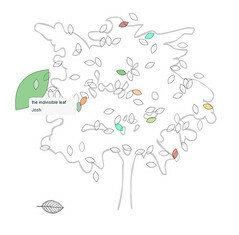 The web address went to a flash movie, which represents the tree and everyone’s leaves. At the moment people can change the colours of their leaves. Friends and relatives reading this: If you haven’t got one yet, it’s because I don’t know your address. Please email it to me. I’m still planning some extensions to the functionality of the tree. It’s really fun having a crisp, anti-aliased display platform to play with for interactions, too, and the PHP/MySQL/XML/Flash connection is not too complicated to work with. I’d love to hear your thoughts about improvements and extensions to the tree app, so don’t be afraid to comment. Loving the blog, been reading for about 6 months now, hope you’re well!